They look innocent and delicious. Don’t be deceived. I sit here, just seething. There is a box of tagalongs right behind me on the counter. An OPEN box. The fact that I am even able to write this without chomping on one, and then another, and then another….. means there is something seriously wrong. Like, the world might be ending kind of wrong. If there is one thing I can always count on to illustrate my complete lack of self control with regard to junk food… it’s girl scout cookies, right?? Well, apparently the girl scouts must think they are doing me some kind of favor, but I don’t see it that way. It feels more like mutiny to me. And I don’t even know if I’m using that word properly, not being a sailor and all…but it feels like the best word to capture my feelings of betrayal. Let me tell you a little story. A story of dreams being shattered. I am, like many of you, a very, very strong supporter of the girl scouts. I donate to them without fail every year, buying boxes and boxes of cookies. Because it’s a good cause. Now, I’ve gotten into the habit of eating these cookies, sometimes even eating most of the cookies before anyone else in the house can find them. This is how I keep obesity from claiming more victims. It’s selfless, really. My favorites are always the same. 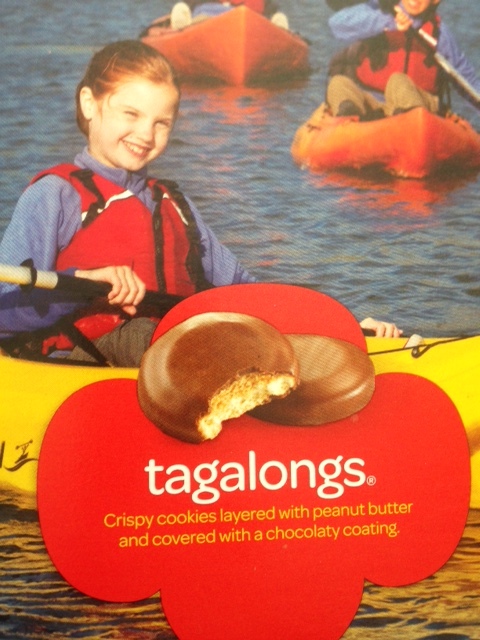 Tagalongs. Samoas. Thin mints. And a few other boxes just for variety. But those three, those are the staples. Thoughts of those cookies are what keeps me going during the rest of the year, and able to turn up my nose at the Keebler elves shoddy imitations sitting on the grocery store shelves. I’ve never cheated. My internal cookie clock started going off around January. I called my cookie contact. Not time to order yet. After much impatient waiting, I got my order in. Extra boxes of everything. Then more impatient waiting. Why do they make you order so early and then wait, and wait before those cookies come in?? I would call up my cookie friend, listen half-heartedly to some blah-blah-blah about her life…then cut her off. “Where are the cookies? ?” GEEEZ, not in yet??!! By the time they came, I was practically twitching in anticipation. There they were, boxes and boxes of those coveted cookies. Sitting on my counter. Waiting for me. 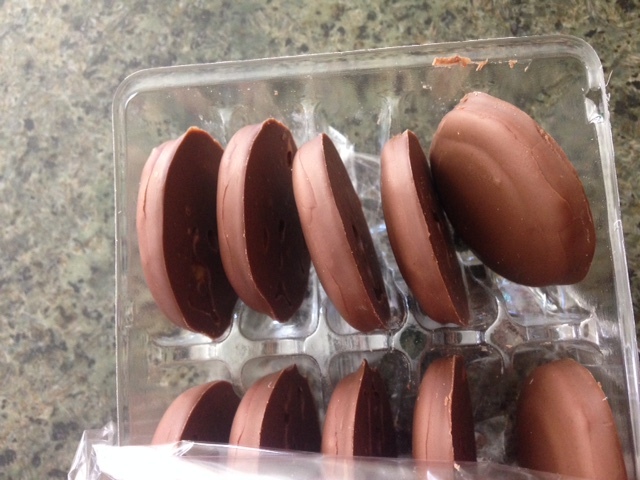 I grabbed the tagalongs, my absolute FAVORITE. Took one. Decided to take 4 instead. Headed up to fold laundry, giving myself about 10 minutes before I had to come down for more. I ate the first cookie. Hmmmm, didn’t feel anything close to orgasmic. Tried another. WHAT IS GOING ON HERE?! They don’t taste the same! They are missing something critical. Something that would guarantee my self loathing after inhaling a good half box in one sitting. I nibbled on the third cookie, trying to figure out the difference. It just…. didn’t have it. That special something was gone. I eyed the last cookie. For the first time in my life, not wanting it. I ate it, just in case. But still disappointed. Where are you hiding?? I need you-secret amazing ingredient!!! I called my friend and cookie supplier. Trying to be calm. “What in gods name happened to the tagalongs!!??? I can’t even eat anymore! What did they do!!? ?” She wasn’t sure. But did mention that some cookies are made at different bakeries and so will taste different from bakery to bakery. She’s right. But I’m still thinking corners are being cut. Someone found cheaper ingredients. 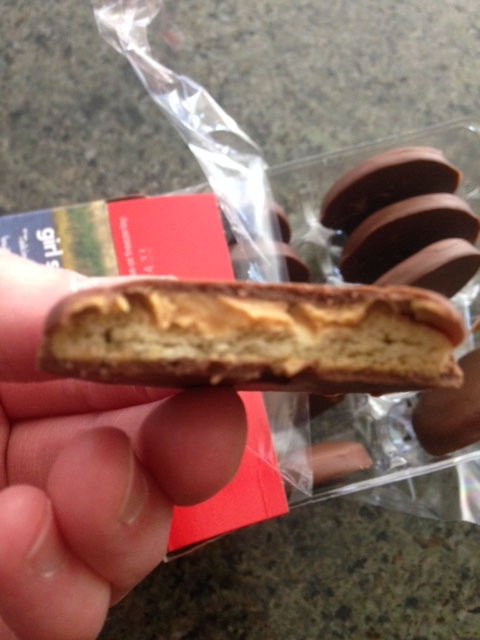 Someone decided to sneak a smidge less peanut butter in each cookie. Whatever the case, I am suffering. One might think I would be grateful for the removal of such an obvious object of weakness for me. No thanks. I would rather be the one to overcome my cookie addiction on my own terms. I don’t WANT help!! I don’t know what this means for the future, my future with the girl scouts. Thank god, the samoas are still as addictive as they can possibly be. I just try to ignore the label as it keeps trying to remind me each cookie is 70 calories. I imagine it’s better to get all those calories in during one sitting and just be done with it, rather than spread them over any reasonable amount of time. Consider this your public service announcement. Lest you too find yourself with far too much self control around cookies that have always been able bend you to their will in the past. It’s scary. This entry was posted in food, humor and tagged addiction, change ingredients, cookies, girl scout cookies, tagalongs. Bookmark the permalink.